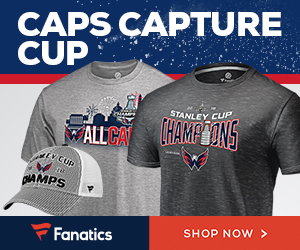 However, Stan Mikita — the all-time scoring and games played leader for the ‘Hawks — is noticeably absent. 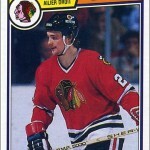 They really should have been a sixth card to include Mikita, or he should have replaced Larmer in the set. The design is simple and not overdone. 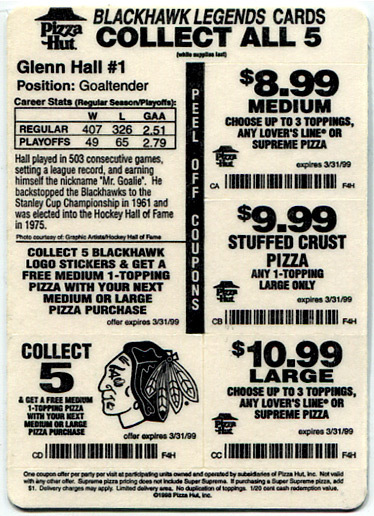 There’s a big player photo, a Blackhawks’ logo, a Pizza Hut logo, the player’s name and “Blackhawk Legends” at the bottom. 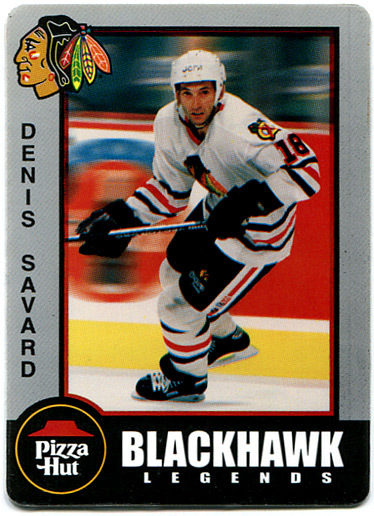 (Strange that they used the singular form “Blackhawk” and not the plural “Blackahwks.”) Maybe changing the gray border to red would have made this design a little more exciting, but all in all these cards look fine; almost like cards from the 1980s and not the late 1990s. About 75% of the back of each card is filled with coupons. The rest of the card offers little room for stats, but it tries. Regular season and playoff goal, assist and point totals are given for Hull, Savard and Larmer. Regular season and playoff win, loss and GAA totals are given for Hall and Esposito. 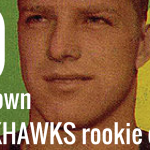 There are also a few sentences about each player, highlighting their careers with the ‘Hawks. 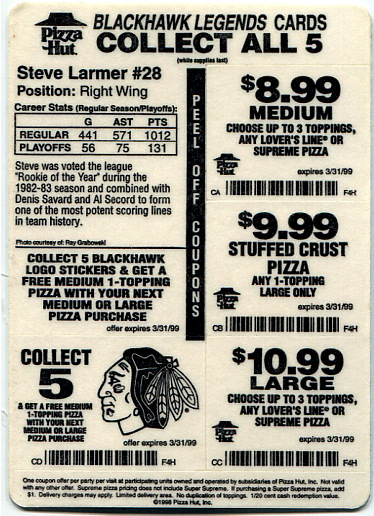 These cards were given away at Pizza Hut during the 1998-99 season. 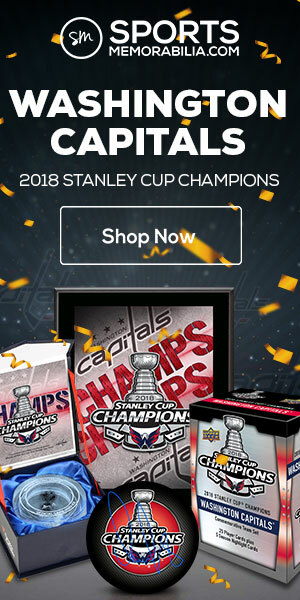 Presumably, you’d get one with a purchase, and I believe a different card was given out each week. The cards are printed on thin plastic, like a credit card, but flexible. Corners are rounded. 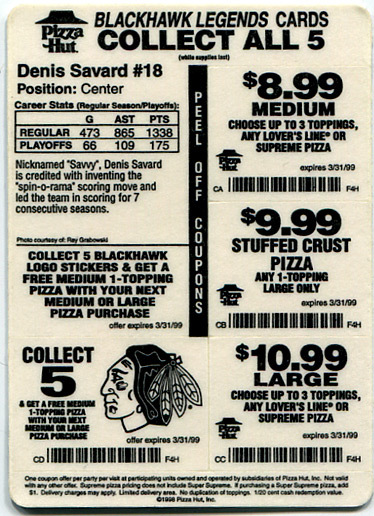 Coupons on the back could be peeled off and used for discounts on future orders. 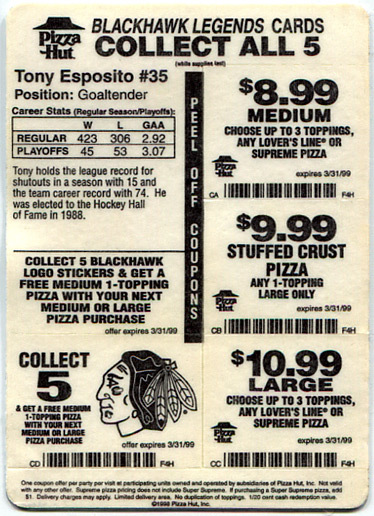 However, each coupon also has a bar code that could be scanned instead, so collectors didn’t have to make the card “less mint” by removing the coupons. Anyone who collected all five cards could get a free medium pizza with the purchase of a medium or large pizza. 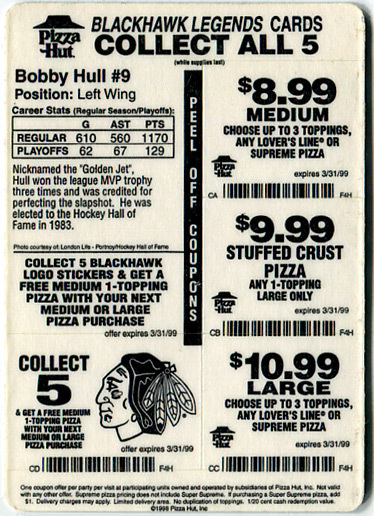 The Pizza Hut Blackhawks Legends is a nice little set that die-hard ‘Hawks fans will like, but the absence of Stan Mikita makes it feel incomplete. Here are front and back views of every card in the set, as well as the short bio from the back of each card. 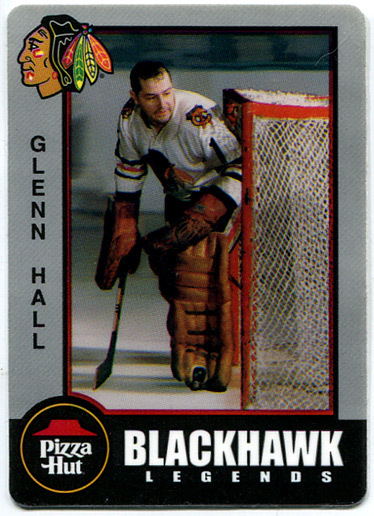 Glenn Hall #1 – Hall played in 503 consecutive games, setting a league record, and earning himself the nickname “Mr Goalie”. He backstopped the Blackhawks to the Stanley Cup Championship in 1961 and was elected into the Hockey Hall of Fame in 1975. 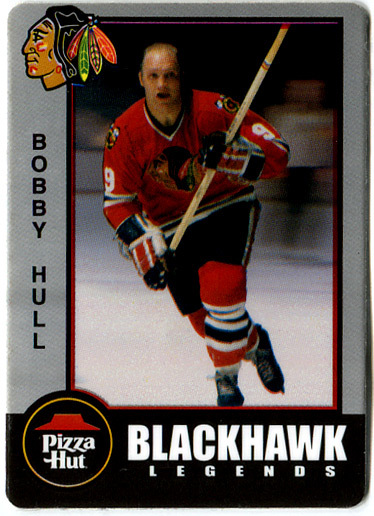 Bobby Hull #9 – Nicknamed the “Golden Jet”, Hull won the league MVP trophy three times and was credited for perfecting the slapshot. He was elected to the Hockey Hall of Fame in 1983. 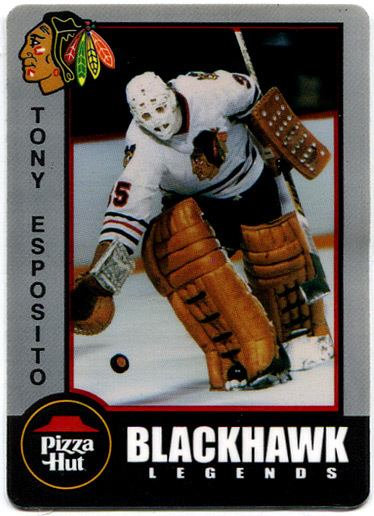 Tony Esposito #35 – Tony holds the league record for shutouts in a season with 15 and the team career record with 74. 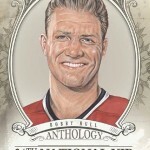 He was elected to the Hockey Hall of Fame in 1988. 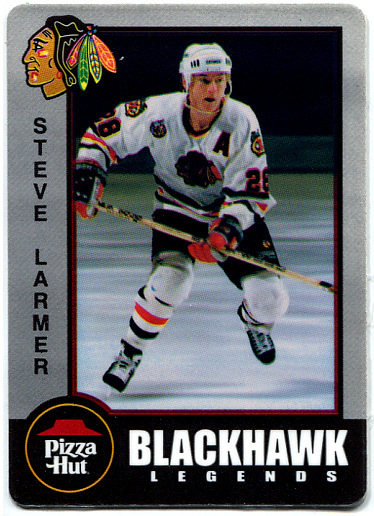 Steve Larmer #28 – Steve was voted the league “Rookie of the Year” during the 1982-83 season and combined with Denis Savard and Al Secord to form one of the most potent scoring lines in team history. Just put him in, already. 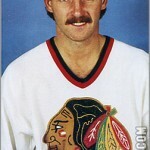 No argument from me; both Steve Larmer and Doug Wilson should be in the Hockey Hall of Fame and have their numbers retired by the Chicago Blackhawks. 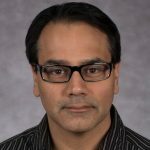 Those are the only two wrongs that the team has not righted yet.